Do I cross my arms all day?? How did the middle of this sweater get so wrinkly!? The weather is a-changing, and I finally got around to getting all of my sweaters shaken out from being stored in vacuum bags all Summer. I am so happy that this relaxed sweatshirt style of sweater is "in"... clothes that are as comfy as my yoga pants but are accepted as attire to be worn out of the house are my favorite! After waving goodbye to my favorite Summer sandals, I don't even know if I can say this... but it looks like my favorite Fall loafers are on their last season as well... but to heal my broken heart, I picked up my first pair of ShoeMint shoes (using $30 off promo "StepIn30" good until 10/03)... shopping therapy is real my friends! Have you pulled your Fall clothes out? Any items you were surprised to find? Any trends from last Fall you will be ditching? i'm in love with this outfit! I want those jeans! and your hair looks so cute like this! This is such a great look on you. Love the headband and those jeans are amazing! Love this outfit!! I love slightly slouchy sweaters! They're the best and so comfy! I've already put away my sandals and dusted off the boots! your outfit is so cute and chic, and it honestly looks like it came right from the pages of a j. crew or gap ad! also, now that i know about the shoe mint code, i'm seriously considering a pair of boots (even though i have plenty already)! this whole outfit just screams fall! u look great! I love sweater weather!! That sweater is so cute, I love the color. And clothes that are comfy but look put together are the best ever. This is a really great look! So adorable. I love the color of the sweater and the look is just perfect. 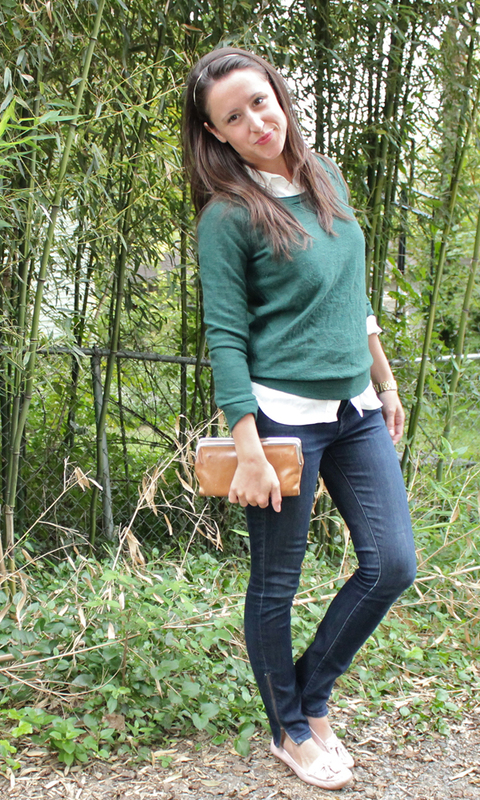 Simple an ideal outfit to be comfy when running your errands or going to the cinema with your friends. It's so versatile!! well you look cute! i love the mixture of blues! i'm working on my closet now. hahaha i found your blog through lisa's. i loved the pleated leather skirt and burgundy combination you wore. very classy! have a great week! it finally is feeling like fall here too! thank the Lord!!! I have pulled all my stuff down and am ready to out on my riding boots! I love the simple and classic look today!! You have such a natural beauty, my friend! Yeah for sweater weather! I love your layers, and your hair looks so cute in a headband. This outfit is fabulous. 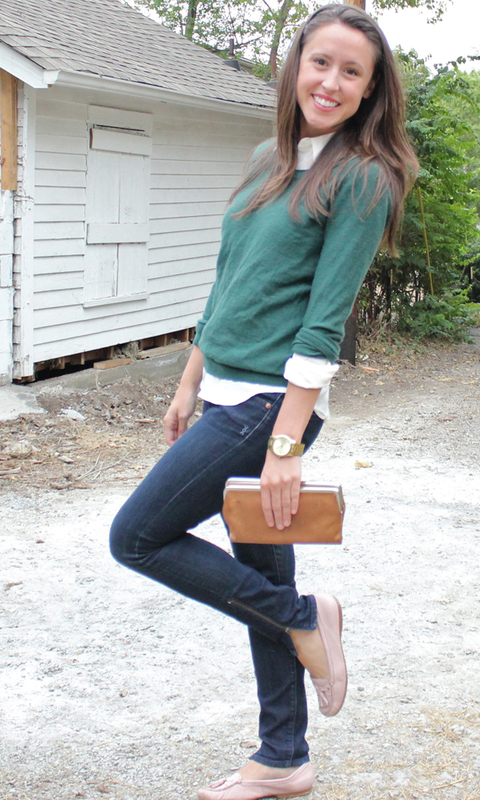 I looove this preppy look...the headband, the sweater, the loafers...all of it! I haven't broken out the sweaters just yet...it's supposed to be nearly 80 later this week so I think I might be wearing shorts! I recently pulled all of my fall stuff out of storage too. 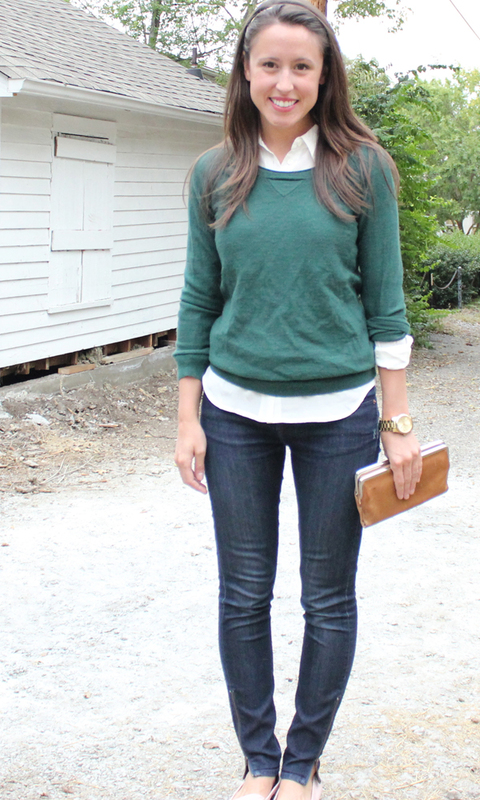 This is such a cute outfit--I love the relaxed sweater and loafers! Such a nice color sweater, i love it. So cute! I love your jeans. I need to get some more, Gap as some cute zipper ones as well I need to pick up! This is classic and gorgeous Fall look. Can't believe its October already. Cute! This is the perfect fall outfit. I love the color of your sweater! I am always amazed at how fast my clothes get wrinkled from just sitting at my desk at work! By lunch I somehow look like a mess again haha. Happy October and hope you're having a beautiful day! you are ahead of the game...my sweaters are still in the basement. Haha seriously, where is my wrinkle release spray when I need it!? I really want to put away my summer clothes...but it's over 100 degrees here in CA :-( Love your loafers though! Thank you sweetheart! I love boot season! Love that muted green. I really want a new pair of loafers, yours are so sweet. If you didn't say anything about wrinkle I would have not known. You look great and refreshing. Yes Yes YESSS!!!! You look too stinkin cute! love this look - casual & chic! Thank you! I love calling them jumpers! Your shoes are adorable! I really love the whole look. Your headband makes you look innocent (in a good way, hope that doesn't sound weird/creepy!). girl, I love everything about this outfit. 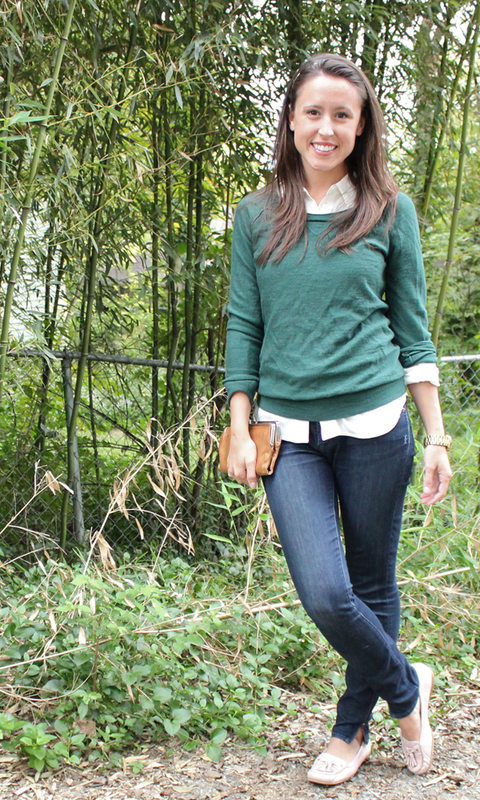 I can not for the life of me layer button ups under sweaters, but I wish I could because it looks so good on others! This is so cute! I too am happy that the comfy, sweatshirt sweater is in! I love how yours still looks dressed up and I love that pretty hunter green shade! So flattering. Love that sweater! I have it in taupe and a dark purple, which is fabulous. 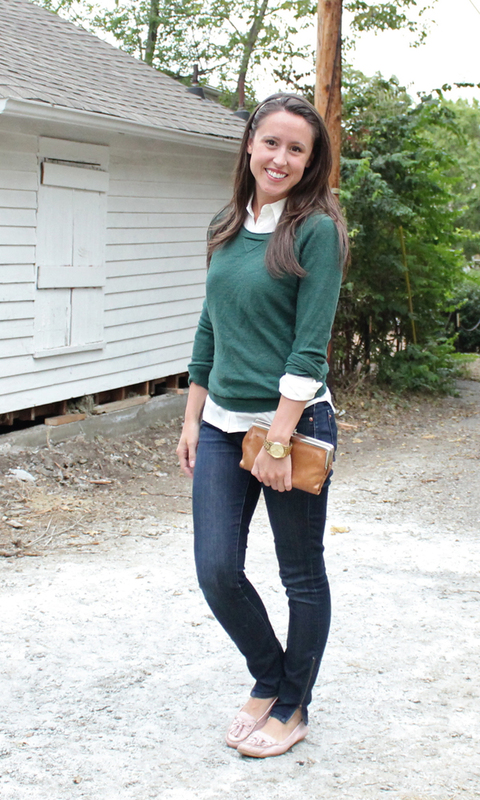 Flats, sweaters, and button downs are my fall staple!